Posted on Friday, January 3rd, 2014 at 6:38 am. After all the holiday treats, boxing fans were licking their chops for Saturday, February 15th, when from the majestic Staples Center in downtown Los Angeles, CA, one of the most anticipated rematches of the New Year was expected to take place. After shocking the boxing world in August with one perfectly placed left hook, veteran Jhonny Gonzalez snatched the WBC featherweight title from three-divisional champ Abner Mares and next month was ready to defend it for the first time. The bout was supposed to be a slight detour on the meteoric rise to super stardom for Mares. After a highly successful amateur career where he participated in the 2004 Olympics representing Mexico, Mares took off running as a pro and became a fan favorite with his tough and rugged all-action style. Known for facing the best in his division, Mares really made himself known by taking the crown of Showtime’s bantamweight tournament defeating Vic Darchynian and Joseph Agbeko, two former world champs. Mares defeated veteran Eric Morel to capture the 122 pound belt and then stopped the tough Daniel Ponce de Leon in nine to take the featherweight title. After that win, there was talk of Mares facing Nonito Donaire and despite a contract being sent to the “Filipino Flash”, the berth between Top Rank and Golden Boy turned to wide for it to happen. Nevertheless, big things were planned for Mares and the thirty-two year old Gonzalez was only supposed to be an easy speed bump en route to bigger and better things. A pro since the age of eighteen, Gonzalez had the rougher and much longer road to glory than Mares. Dropping his first two fights as a pro back in ‘99, it wasn’t until ’05 that he captured his first title, the WBO bantamweight, by defeating Thai Ratanchi Sor Vorapin via 7th round TKO. Wins and losses came with the latter in big fights and when many had written him off, Gonzalez proved the naysayers wrong by stopping kamikaze Hozumi Hasegawa in four to grab the same featherweight title he holds now. 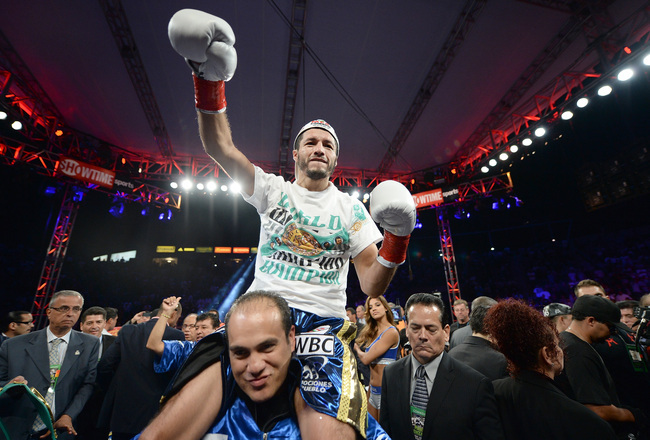 He defended it four times the first time before losing to Ponce de Leon in 2012. Earlier this week Mares announced that he suffered a slight rib injury last weekend during sparring and that the fight would have to be postponed. Now it looks like the date is March 15th. The interesting part here is that Oswaldo Kuchle, head of Gonzalez’s promotional firm Promociones Del Pueblo, referenced an article by boxaldia.com that reported that Mares was in fact not hurt. In their story, the site reports that the gym where Mares was hurt has been closed for the holidays so there was no way, in their eyes, that the injury could have happened. The site also discloses that no x-rays or documents have been produced to support Mares’ story of an injury. In closing, boxaldia.com mentioned that a source close to Golden Boy Promotions postponed the bout so they could beef up the under card and have more time to sell tickets. Abner Mares vs. Joseph Agbeko: A return to a classic? How Low Can Abner Mares Go?